I'm a big fan of LA based facialist, Ole Henriksen's product range. I admit that I'm easily taken in by packaging and Ole Henriksen's is tough to beat, with its striking bold colours (unusual for skincare) but I also feel that the products themselves are good. I was recently sent a skincare travel set from Ole Henriksen as part of a feature I was writing in my professional capacity and contained within it was a miniature version of the Walnut Complexion Scrub, which is suitable for all skin types. I usually prefer chemical, as opposed to physical, exfoliants with my favourite being Heaven by Deborah Mitchell's Skin Polish Exfoliator. 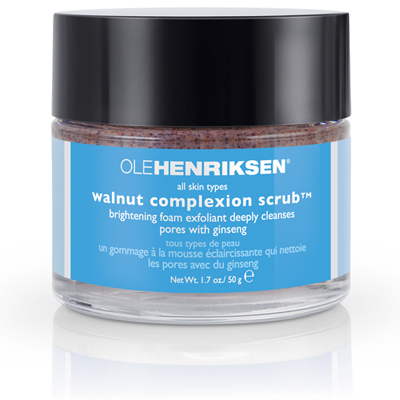 However, I've absolutely fallen in love with Ole Henriksen Walnut Complexion Scrub. As aforementioned, the packaging looks great although I'd prefer a tube for functionality reasons. One aspect which I really like about Ole Henriksen is that the products are printed with a use-by date. The scrub itself has a pearlised look to it which I've tried to capture in the photo (please excuse the lighting!). I was initially concerned that the inclusion of ground walnut would make this harshly abrasive yet I found it surprisingly gentle on my sensitive skin, whilst being effective. There's enough of a grain to encourage massage and a little goes a long way. What's more, the scent is incredible- like sweets & good enough to eat! My skin was left feeling unbelievably soft and looked more radiant than it usually does following a scrub. This feeling continued for a few days following the scrub. Yes, it's expensive at £26 for 50g but I highly recommend this. It's definitely a keeper! Sounds great! Have you ever tried the Ole Henriksen Blueberry Masque? I've wanted to give it a go but I haven't seen any good reviews of it. Will have a check of my stash & if I have it, will post a review. I have a vague memory of trying it a while ago but preferring Lush's Catastrophe Cosmetic for my skin type.